According to report published by Grand View Research, Growing demand for wireless data connections for billboards which are ideal for high-volume pedestrian traffic zones, and customizable content availability are expected to revolutionize the digital display industry over the next seven years. According to a report, “Outdoor LED Display Market Analysis By Application (Billboards, Perimeter Boards, Mobile Panels, Traffic Lights, Video Walls, LED Matrix Boards), By Technology (Individual Mounted, Surface Mounted), By Color Display (Monochrome, Tri-Color, Full Color) And Segment Forecasts To 2022”, published by Grand View Research, Inc., The global outdoor LED display market is expected to reach USD 12.43 billion by 2022. 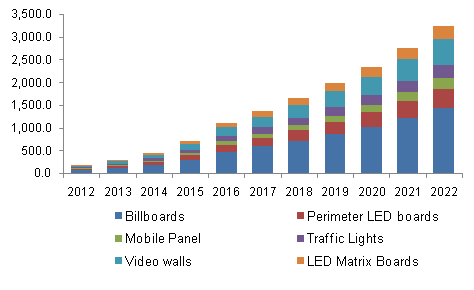 LED mobile panel market is expected to witness robust demand by 2022. These can be easily setup or teardowned along with a ready to use control room; it also minimizes cabling and display With the rising number of events such as live concerts, exhibitions, brand promotion activities, and sports events on the rise, the LED mobile panels segment is expected to show high growth over the forecast period. Outdoor LED display market share is occupied by companies such as Daktronics, Shenzhen Dicolor Optoelectronics Co Ltd, Electronic Displays, Sony, LG Electronics, and Barco NV. Companies such as Toshiba Corporation, LG Electronics, Panasonic, and Sony Corporation partake in strong networking and enjoy high degree of brand recall. Collaborative Robots Market: The growing interest of Small and Medium-sized Enterprises (SMEs), owing to the low price of cobots, is projected to increase the deployment over the forecast period. Quantum Dot (QD) Display Market: Increasing awareness regarding energy-efficient displays is expected to boost global quantum dot display market growth. Surge in demand for advanced QLED powered TVs has propelled industry growth.